In music, harmony considers the process by which the composition of individual sounds, or superpositions of sounds, is analysed by hearing. Usually, this means simultaneously occurring frequencies, pitches (tones, notes), or chords. The study of harmony involves chords and their construction and chord progressions and the principles of connection that govern them. Harmony is often said to refer to the "vertical" aspect of music, as distinguished from melodic line, or the "horizontal" aspect. Counterpoint, which refers to the relationship between melodic lines, and polyphony, which refers to the simultaneous sounding of separate independent voices, are thus sometimes distinguished from harmony. In popular and jazz harmony, chords are named by their root plus various terms and characters indicating their qualities. In many types of music, notably baroque, romantic, modern, and jazz, chords are often augmented with "tensions". A tension is an additional chord member that creates a relatively dissonant interval in relation to the bass. Typically, in the classical common practice period a dissonant chord (chord with tension) "resolves" to a consonant chord. Harmonization usually sounds pleasant to the ear when there is a balance between the consonant and dissonant sounds. In simple words, that occurs when there is a balance between "tense" and "relaxed" moments. The term harmony derives from the Greek ἁρμονία harmonia, meaning "joint, agreement, concord", from the verb ἁρμόζω harmozō, "(Ι) fit together, join". In the past, harmony often referred to the whole field of music, while music referred to the arts in general. In Ancient Greece, the term defined the combination of contrasted elements: a higher and lower note. Nevertheless, it is unclear whether the simultaneous sounding of notes was part of ancient Greek musical practice; harmonía may have merely provided a system of classification of the relationships between different pitches. In the Middle Ages the term was used to describe two pitches sounding in combination, and in the Renaissance the concept was expanded to denote three pitches sounding together. Aristoxenus wrote a work entitled Harmonika Stoicheia, which is thought the first work in European history written on the subject of harmony. It was not until the publication of Rameau's Traité de l'harmonie (Treatise on Harmony) in 1722 that any text discussing musical practice made use of the term in the title, although that work is not the earliest record of theoretical discussion of the topic. The underlying principle behind these texts is that harmony sanctions harmoniousness (sounds that please) by conforming to certain pre-established compositional principles. Descriptions and definitions of harmony and harmonic practice may show bias towards European (or Western) musical traditions. For example, South Asian art music (Hindustani and Carnatic music) is frequently cited as placing little emphasis on what is perceived in western practice as conventional harmony; the underlying harmonic foundation for most South Asian music is the drone, a held open fifth interval (or fourth interval) that does not alter in pitch throughout the course of a composition. Pitch simultaneity in particular is rarely a major consideration. Nevertheless, many other considerations of pitch are relevant to the music, its theory and its structure, such as the complex system of Rāgas, which combines both melodic and modal considerations and codifications within it. So, intricate pitch combinations that sound simultaneously do occur in Indian classical music—but they are rarely studied as teleological harmonic or contrapuntal progressions—as with notated Western music. This contrasting emphasis (with regard to Indian music in particular) manifests itself in the different methods of performance adopted: in Indian Music improvisation takes a major role in the structural framework of a piece, whereas in Western Music improvisation has been uncommon since the end of the 19th century. Where it does occur in Western music (or has in the past), the improvisation either embellishes pre-notated music or draws from musical models previously established in notated compositions, and therefore uses familiar harmonic schemes. Yet the evolution of harmonic practice and language itself, in Western art music, is and was facilitated by this process of prior composition, which permitted the study and analysis by theorists and composers of individual pre-constructed works in which pitches (and to some extent rhythms) remained unchanged regardless of the nature of the performance. Some traditions of Western music performance, composition, and theory have specific rules of harmony. These rules are often described as based on natural properties such as Pythagorean tuning's law whole number ratios ("harmoniousness" being inherent in the ratios either perceptually or in themselves) or harmonics and resonances ("harmoniousness" being inherent in the quality of sound), with the allowable pitches and harmonies gaining their beauty or simplicity from their closeness to those properties. This model provides that the minor seventh and (major) ninth are not dissonant (i.e., are consonant). Early Western religious music often features parallel perfect intervals; these intervals would preserve the clarity of the original plainsong. These works were created and performed in cathedrals, and made use of the resonant modes of their respective cathedrals to create harmonies. As polyphony developed, however, the use of parallel intervals was slowly replaced by the English style of consonance that used thirds and sixths.[when?] The English style was considered to have a sweeter sound, and was better suited to polyphony in that it offered greater linear flexibility in part-writing. Early music also forbade usage of the tritone, due to its dissonance, and composers often went to considerable lengths, via musica ficta, to avoid using it. In the newer triadic harmonic system, however, the tritone became permissible, as the standardization of functional dissonance made its use in dominant chords desirable. Most harmony comes from two or more notes sounding simultaneously—but a work can imply harmony with only one melodic line by using arpeggios or hocket. Many pieces from the baroque period for solo string instruments—such as Bach's Sonatas and partitas for solo violin and cello—convey subtle harmony through inference rather than full chordal structures. These works create a sense of harmonies by using arpeggiated chords and implied bass lines. The implied basslines are created with low notes of short duration that many listeners perceive as being the bass note of a chord. Example of implied harmonies in J.S. Bach's Cello Suite no. 1 in G, BWV 1007, bars 1–2. Carl Dahlhaus (1990) distinguishes between coordinate and subordinate harmony. Subordinate harmony is the hierarchical tonality or tonal harmony well known today. Coordinate harmony is the older Medieval and Renaissance tonalité ancienne, "The term is meant to signify that sonorities are linked one after the other without giving rise to the impression of a goal-directed development. A first chord forms a 'progression' with a second chord, and a second with a third. But the former chord progression is independent of the later one and vice versa." Coordinate harmony follows direct (adjacent) relationships rather than indirect as in subordinate. Interval cycles create symmetrical harmonies, which have been extensively used by the composers Alban Berg, George Perle, Arnold Schoenberg, Béla Bartók, and Edgard Varèse's Density 21.5. Other types of harmony are based upon the intervals of the chords used in that harmony. Most chords in western music are based on "tertian" harmony, or chords built with the interval of thirds. In the chord C Major7, C–E is a major third; E–G is a minor third; and G to B is a major third. Other types of harmony consist of quartal and quintal harmony. 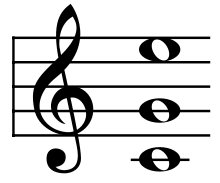 A unison is considered a harmonic interval, just like a fifth or a third, but is unique in that it is two identical notes produced together. The unison, as a component of harmony, is important, especially in orchestration. In pop music, unison singing is usually called doubling, a technique The Beatles used in many of their earlier recordings. 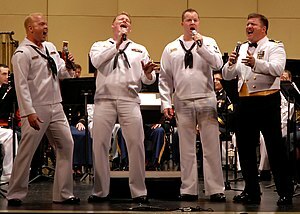 As a type of harmony, singing in unison or playing the same notes, often using different musical instruments, at the same time is commonly called monophonic harmonization. An interval is the relationship between two separate musical pitches. For example, in the melody Twinkle Twinkle Little Star, between the first two notes (the first "twinkle") and the second two notes (the second "twinkle") is the interval of a fifth. What this means is that if the first two notes were the pitch C, the second two notes would be the pitch "G"—four scale notes, or seven chromatic notes (a perfect fifth), above it. Therefore, the combination of notes with their specific intervals—a chord—creates harmony. For example, in a C chord, there are three notes: C, E, and G. The note C is the root. The notes E and G provide harmony, and in a G7 (G dominant 7th) chord, the root G with each subsequent note (in this case B, D and F) provide the harmony. The consonant intervals are considered the perfect unison, octave, fifth, fourth and major and minor third and sixth, and their compound forms. 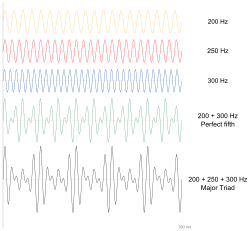 An interval is referred to as "perfect" when the harmonic relationship is found in the natural overtone series (namely, the unison 1:1, octave 2:1, fifth 3:2, and fourth 4:3). The other basic intervals (second, third, sixth, and seventh) are called "imperfect" because the harmonic relationships are not found mathematically exact in the overtone series. In classical music the perfect fourth above the bass may be considered dissonant when its function is contrapuntal. Other intervals, the second and the seventh (and their compound forms) are considered Dissonant and require resolution (of the produced tension) and usually preparation (depending on the music style). Note that the effect of dissonance is perceived relatively within musical context: for example, a major seventh interval alone (i.e., C up to B) may be perceived as dissonant, but the same interval as part of a major seventh chord may sound relatively consonant. 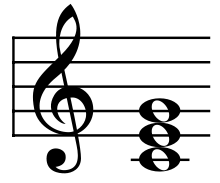 A tritone (the interval of the fourth step to the seventh step of the major scale, i.e., F to B) sounds very dissonant alone, but less so within the context of a dominant seventh chord (G7 or D♭7 in that example). Continuing to stack thirds on top of a seventh chord produces extensions, and brings in the "extended tensions" or "upper tensions" (those more than an octave above the root when stacked in thirds), the ninths, elevenths, and thirteenths. This creates the chords named after them. (Note that except for dyads and triads, tertian chord types are named for the interval of the largest size and magnitude in use in the stack, not for the number of chord members : thus a ninth chord has five members [tonic, 3rd, 5th, 7th, 9th], not nine.) Extensions beyond the thirteenth reproduce existing chord members and are (usually) left out of the nomenclature. Complex harmonies based on extended chords are found in abundance in jazz, late-romantic music, modern orchestral works, film music, etc. Typically, in the classical Common practice period a dissonant chord (chord with tension) resolves to a consonant chord. Harmonization usually sounds pleasant to the ear when there is a balance between the consonant and dissonant sounds. In simple words, that occurs when there is a balance between "tense" and "relaxed" moments. For this reason, usually tension is 'prepared' and then 'resolved', where preparing tension means to place a series of consonant chords that lead smoothly to the dissonant chord. In this way the composer ensures introducing tension smoothly, without disturbing the listener. Once the piece reaches its sub-climax, the listener needs a moment of relaxation to clear up the tension, which is obtained by playing a consonant chord that resolves the tension of the previous chords. The clearing of this tension usually sounds pleasant to the listener, though this is not always the case in late-nineteenth century music, such as Tristan und Isolde by Richard Wagner. Post-nineteenth century music has evolved in the way that tension may be less often prepared and less formally structured than in Baroque or Classical periods, thus producing new styles such as post-Romantic harmony, impressionism, pantonality, jazz and blues, where dissonance may not be prepared in the way seen in "common practice era" harmony. In a jazz or blues song, the tonic chord that opens a tune may be a dominant seventh chord. A jazz song may end on what in Classical music is a quite dissonant chord, such as an altered dominant chord with a sharpened eleventh note. ^ ἁρμονία. Liddell, Henry George; Scott, Robert; A Greek–English Lexicon at the Perseus Project. ^ ἁρμόζω in Liddell and Scott. ^ Aristoxenus (1902). Harmonika Stoicheia (The Harmonics of Aristoxenus). Translated by Macran, Henry Stewart. Georg Olms Verlag. ISBN 3487405105. OCLC 123175755. ^ a b c d Whittall, Arnold (2002). "Harmony". In Latham, Alison (ed.). The Oxford Companion to Music.